It's here!! Maluca's mixtape "China Food" is out and it's got some pretty dope throwback Playero-esque beats. 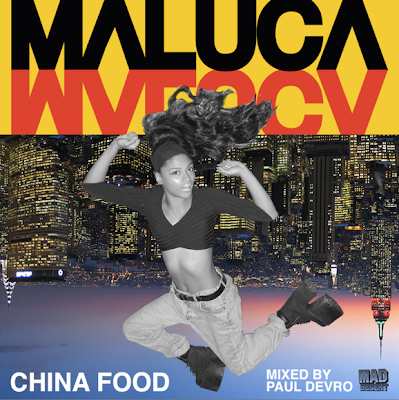 Download this immediately! Oscar Grant, A Victim Of American Fear. As so many Americans gear up for Fourth of July fireworks this weekend, the U.S. Territory of Puerto Rico roils from a brutal civil rights showdown unleashed by a far-right wing government, now seemingly hell bent on destroying the recent unprecedented victory of a two-month long student strike against privatization of higher education at the University of Puerto Rico. The broader implications are crucial on numerous fronts, including the struggle to maintain broad access to public higher education and efforts to rein in runaway neoliberal policies that have wreaked havoc on the global economy, resulting in draconian austerity measures worldwide. For the violence and repression seen in Greece and at the G20 in Toronto appears to now be visiting this Caribbean island nation of about four million U.S. citizens, the homeland of more than an additional four million Puerto Ricans in the United States, the second largest U.S. Latino group. While the economic crisis in Puerto Rico--the worst since the 1940s, if not the 1930s-has been deepening for years, and the current right wing government has aggressively implemented a hard-line, unpopular neoliberal agenda since its broad electoral victory last November, it appears as if the recent UPR student strike victory has touched off a firestorm, with a police attack on peaceful demonstrators at Puerto Rico's Capitol building on Wednesday injuring dozens, some seriously. The UPR strike concluded June 21 after a tense, two-month shut down of 10 campuses in a system serving nearly 65,000 students at the end of the academic year, with an accord that by all accounts was an unprecedented strike victory, in historic, hemispheric terms. A widely-supported student movement remarkable for its coalition building across traditionally distinct and even contentious social and political sectors coalesced against threatened erosion of broad public access to the widely-regarded state university, as well as its increasing privatization. With tensions high after police and riot squads had attacked and injured students, their parents and journalists on at least three occasions, an agreement finally reached through judicial mediation met with the students' basic demands, reinstating cancelled tuition waivers, temporarily forestalling a tuition hike or imposition of student fees, and protecting strike leaders from summary suspension reprisals. The accord, signed by a majority of the Board of Trustees, though those refusing included the university and board presidents, was hailed as an achievement in civil conflict resolution, especially in light of the history of previous UPR strikes that had ended in deadly violent repressions. Immediately after however, the Puerto Rico state legislature, dominated by the extreme right of the local Pro-Statehood party, rapidly expanded the university Board of Trustees, with the governor approving four new appointees, and a new but divided board quickly imposed a $800 student fee starting in January, and made it permanent, reminiscent of the imposition of fees at University of California by then Gov. Ronald Reagan. The legislature also quickly dismantled a long-standing UPR tradition of student assemblies, replacing them with private electronic computer voting devoid of open debate. Other cuts were also implemented affecting professors and adjunct instructors, who now make up about 40 percent of the UPR faculty, following trends in the United States, where 60 percent of all professors occupy such increasingly precarious positions. In a far worse economic straits than the states of California or Michigan, Puerto Rico is confronting its worst fiscal crisis in decades, and UPR the biggest fiscal crisis of its 100-year existence. As throughout much of the world facing related circumstances, virulent and organized opposition to drastic cuts principally directed at the working and deteriorating middle classes has mushroomed, especially since the current global crisis, in Alan Greenspan's own befuddled words, was caused by greed-induced corruption among the highest echelons of the world economy. While the neoliberal agenda of Puerto Rico's current political leaders look back to the very doctrines now being challenged in the United States and throughout Latin America, the UPR student movement embodies the vanguard of the contemporary 21st Century, as reflected by their symbols and tactics, including the democratizing internet, egalitarian rainbow flags, sustainable organic farming, an effervescence of alternative arts, and new coalition building among center, right and left, in tandem with occupation practices inspired by international student movements as far as California, Spain, France and Greece. Though a shocking collective trauma, the violent crackdown at the Capitol Wednesday was not entirely surprising given the current administration's assault on all fronts since coming into power, targeting progressive, cultural and social welfare institutions and agencies with crippling budget cuts, attempting to dissolve Puerto Rico's bar association, lifting environmental protections to whole swaths of protected lands, and passing a now notorious law, called Ley 7, that not only dismisses 20,000 public employees, but declares null and void all public sector union contracts for three years, with the only recourse to challenging the law being to petition the local Supreme Court, now stacked with new appointments in the administration's favor. The governor has also activated the National Guard, amidst criticism from groups such the Puerto Rico chapters of the ACLU and Amnesty International. Common in Puerto Rico, however, though unusual at most U.S. state universities, is the way political parties assume control of UPR leadership by appointing a new president, also recently achieved. This is in part because the UPR is widely regarded as national patrimony, and is one of the few places left in the country where dissent may be cultivated. As opposition to these policies expands, as seen in a massive national strike in October which drew a quarter of a million workers into the streets, so has the government's seeming intolerance to any opposition, as Gov. Luis Fortuño, Senate President Thomas Rivera Schatz and UPR president José Ramón de la Torre commonly resort to Cold War era red-baiting with media campaigns labeling protestors as Socialists, Communists, and professional rabble rousers out to destabilize the country. The clamp down has so far gone as far as banning journalists from Senate chambers for four days last week during the country's budget sessions, prompting media organizations to petition in court to regain access. "I don't think there is any doubt that the intention of this government is to set back civil rights," said Judith Berkan, a long-time civil rights attorney and a law professor at University of Puerto Rico and InterAmerican University in San Juan, adding that the administration has enacted a staggering number of measures to neutralize and debilitate all those perceived as a threat to a local oligarchy acting in concert with U.S. interests. Attempts were made to reach Resident Commissioner Pedro Pierluisi, Puerto Rico's non-voting representative in the U.S. Congress, and UPR President José Ramón de la Torre for comment, but they were not available at press time. The irony that the Pro-U.S. Statehood party of Gov. 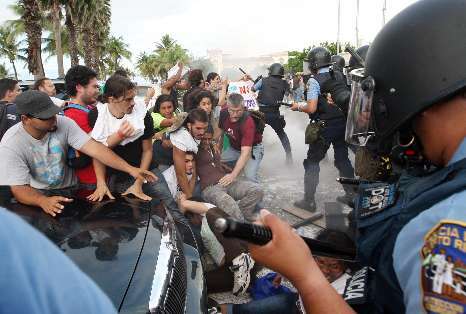 Fortuño is now curtailing the most basic press and civil liberties is not lost on UPR student strike leaders who witnessed and were injured at Wednesday's melee, including those who belong to the pro-Statehood party themselves, and voted for the sitting governor. "It pains me as a statehooder that this government has not learned the lessons of U.S. civil rights struggles of decades ago," said Aníbal Núñez, a student at the UPR law school and a member of the student negotiating committee. Núñez acknowledged the participation of students affiliated with Socialist groups among strike leaders and the student negotiating committee, and said they overcame their differences via universal concerns for education as a social necessity, as they gained each others' respect while coalition building together, adding that if he could not overcome ideological differences enough to collaborate, he would still believe in their right to pluralistically exist. The notion that accessible, quality higher education contributes to economic recovery runs counter to the widening U.S. trend of students graduating with crippling debt, as public education has for years now faced diminishing state support. A common argument used by the administration during the UPR strike was its affordable tuition, at less than $2,000 per year for undergraduates before the recently imposed fees. But while tuition is cheaper than probably any other state university in the United States, average income in Puerto Rico is also far lower than any other U.S. state, with about 48 percent of the population living in poverty as defined by U.S. federal standards, and the cost of living in San Juan at least, far higher than at oft compared institutions in Baton Rouge, Louisiana, or Oxford, Mississippi. This tradition of maintaining broad public access to a quality state institution of higher learning is a hard earned point of pride at UPR, compared to institutions that have recently reneged their public mission with sudden and steep fee/tuition increases, such as at University of California, where students also opposed, occupied and met with police repression, but could not stave off a 32% fee hike imposed in November. As UPR administrators continue to grapple with what was a nearly $200 million budget shortfall for next year going into the strike, in search of additional or alternative money saving and raising sources, an emboldened student movement will also regroup and weigh all its options. Future conflicts may be averted by altering the very style of governance at UPR, a top-down and paternalistic holdover from the past, as this could go a long way toward making students, as well as professors and staff who also have large stakes at play, part of a give-and-take process. For come what may in the global fiscal crisis in the coming decade, these students are the future of new Americas of increasingly porous borders and dramatic, rapid demographic, political, cultural, informational and economic shifts, as the old order, the vestiges of the Cold War in Puerto Rico and in South Florida for example, fade into the proverbial sunset. "We may not hold the power but we have the will power," stated law student Núñez, "and given the choice, I prefer the latter." UPR administrators and Statehood party leaders would do well to recognize and reach out to the productive potential of this new power, shift gears and learn to act on the principles they purportedly hold dear. This story has been making rounds in academic circles (check out Jasbir Puar and Tavia Nyong'o on Butler's refusal over at Bully Bloggers). Queer Theorist Judith Butler refused the Prize for Civic Courage being awarded to her at this year's Berlin Pride and instead offered the Prize to local feminist and queer anti-racist groups including Gays and Lesbians From Turkey (GLADT), LesMigraS, SUSPECT, and ReachOut. When I consider what it means today, to accept such an award, then I believe, that I would actually lose my courage, if i would simply accept the price under the present political conditions. ... For instance: Some of the organizers explicitly made racist statements or did not dissociate themselves from them. The host organizations refuse to understand antiracist politics as an essential part of their work. Having said this, I must distance myself from this complicity with racism, including anti-Muslim racism. We all have noticed that gay, bisexual, lesbian, trans and queer people can be instrumentalized by those who want to wage wars, i.e. cultural wars against migrants by means of forced islamophobia and military wars against Iraq and Afghanistan. In these times and by these means, we are recruited for nationalism and militarism. Currently, many European governments claim that our gay, lesbian, queer rights must be protected and we are made to believe that the new hatred of immigrants is necessary to protect us. Therefore we must say no to such a deal. To be able to say no under these circumstances is what I call courage. But who says no? And who experiences this racism? Who are the queers who really fight against such politics? 1) GLADT: Gays and Lesbians from Turkey. This is a queer migrant self-organization. This group works very successfully within the fields of multiple discrimination, homophobia, transphobia, sexism, and racism. 2) LesMigraS: Lesbian Migrants and Black Lesbians, is an anti-violence and anti-discrimination division of Lesbenberatung Berlin. It has worked with success for ten years. They work in the fields of multiple discrimination, self-empowerment, and antiracist labor. 3) SUSPECT: A small group of queers that established an anti-violence movement. They assert that it is not possible to fight against homophobia without also fighting against racism. 4) ReachOut is a councelling center for victims of rightwing extremist, racist, anti-Semitic , homophobic, and transphobic violence in Berlin. It is critical of structural and governmental violence. Yes, and these are all groups that work in the Transgeniale CSD, that shape it, that fight against homophobia, transphobia, sexism, racism, and militarism, and that - as opposed to the commercial CSD - did not change the date of their event because of the Soccer World Cup. I would like to congratulate these groups for their courage, and I am sorry that, under these circumstances, I am unable to accept this award. In a strongly-worded resolution passed by its Executive Board on May 22, 2010, the American Anthropological Association (AAA) condemned the enactment of a new law in Arizona that would allow law enforcement to investigate an individual's immigration status even if the person in question is not suspected of committing a crime. Arizona Senate Bill (SB) 1070, signed into law by Arizona Governor Jan Brewer one month ago, has proven to be controversial as it is seen as the broadest and most strict law on immigration enacted in generations. The measure, among other things, makes the failure to carry certain immigration documents a crime and gives the police broad power to detain anyone suspected of being in the country illegally. Arizona has a large population of Hispanic immigrants, and critics of the law, including AAA, see the law as a movement to target and harass this group. A recently-passed amendment to SB 1070, House Bill 2162, clarifies that a person's immigration status can only be investigated during a legal stop, detention or arrest, but the intent (and subsequent implementation) of the law was seen by the association leadership as problematic to the well-being of immigrant populations in the state. "The AAA has a long and rich history of supporting policies that prohibit discrimination based on race, ethnicity, national origin, religion or sexual orientation," AAA Executive Board Member (and resolution author) Debra Martin said in a statement issued today. "Recent actions by the Arizona officials and law enforcement are not only discriminatory; they are also predatory and unconstitutional." The AAA resolution also pledges that the association as a whole will refuse to hold a scholarly conference in Arizona until SB 1070 is either repealed or struck down as constitutionally invalid. Whereas, there exists more than a century of anthropological findings on the crucial social and political impact of discrimination based on race, national origin and ethnicity and a long history of anthropological concern for the well-being of immigrant populations, the American Anthropological Association considers these laws and the ways they may be implemented to be discriminatory. Be it further resolved that this boycott of Arizona as a place to hold meetings of the American Anthropological Association does not apply to Indian Reservations within the State of Arizona. Founded in 1902, the American Anthropological Association is the world’s largest professional organization of anthropologists and others interested in anthropology, with an average annual membership of more than 10,000. The Arlington, VA – based association represents all specialties within anthropology – cultural anthropology, biological (or physical) anthropology, archaeology, linguistics and applied anthropology. A friend of mine from college getting her graduate degree at UPR alerted me to this story last week (Thanks Ria!). Members of the police department have gotten into quite of bit of hot water since screen grabs of their facebook pages and status updates have started to surface in the media. The officers have been boasting about beating students or complaining about the lack of opportunities to brutalize students. And there are more screen grabs like this of cops expressing their intentions to do physical damage. The cops are crying foul play. 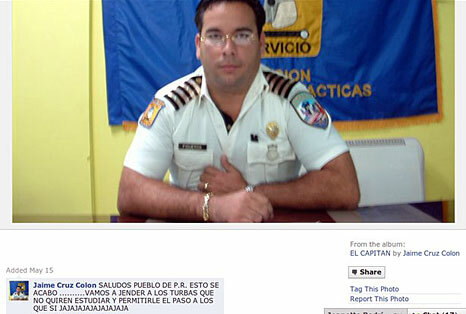 Jaime Cruz Colon, the officer above who said that the police were going to beat up the students who didn't want to learn to make way for those who did, for instance is claiming that he is a victim of hackers. Given that the police department's second in command, Col. José A. Rosa Carrasquillo can be seen in the picture below kicking a student while he is on the ground and restrained, I think it is fair to say that the kind aggression verbal and physical being displayed toward the students permeates the chain of command at many levels, and it is doubtful that hackers would have to invent something like this. The violent repression of students and workers struggles under the Fortuno administration illustrates what many theorists have argued about the neoliberal period -- the fiscal disciplining of the market necessitates the physical disciplining of the populations who are directly affected by economic and political restructuring. They are two sides of the same coin. In this case, the police are not trying to protect private property or quell crime, they are trying to facilitate the changes called for by public law 7. The students are fighting for more than just fee waivers, they are fighting for a new way of doing things. They are protesting the punitive turn and the neoliberal policies that it is meant to protect. They are fighting against the criminalization and punishment of the poor and working classes, and fighting against the use of youth as a scapegoat for societal ills. They are calling not only for the transformation of the University, but also the radical reconfiguration of Puerto Rican society itself. Rima Brusi: "Our Best Investment"
In his budget address a few weeks ago, Gov. Fortuño referred to public, affordable higher education as a “privilege” that Puerto Rico provides to its students at no small cost to its citizens. To reinforce the message, he compared University of Puerto Rico tuition prices to the much higher ones of other, private, higher education institutions in the island, and of colleges and universities in the United States. At the heart of this image is the idea that the university is too inexpensive for the individual students and too expensive for the state, thus rendering student complaints about the elimination of tuition waivers, and their insistence that tuition rates stay low, as shallow. I propose we examine this notion. Is the university really “too cheap?” Is it a “cost” to the state? “Cheap” and “expensive” are relative terms, and they arise from comparing the costs of the UPR with other institutions. However, is the comparison with private institutions in the island, and with public and private universities in the U.S., an appropriate comparison? Private institutions in the island have helped the country meet an increasing demand for higher education degrees, but in terms of efficiency and value, economic studies have shown that the UPR, with double the graduation rate, and producing 95 percent of the island’s research output, represents the best return on investment for public funds. Universities across the U.S., a country traditionally known for its excellence in higher education, are experiencing problems that the states are concerned with. Two related ones are access issues faced by minorities and low-income students and the production of Science, Technology, Engineering and Math, or STEM, degrees. Access problems are in great part due precisely to increasing tuition costs in four-year colleges and universities. STEM degrees hover around 20 percent of U.S. degrees, at a time when the country desperately needs to increase the domestic STEM workforce. Mainland universities have an average of only 14 percent of their student body qualifying for need-based Pell Grants. A number of efforts in the U.S., including the intensive use of federal American Recovery and Reinvestment Act funds, are directed at increasing the number of underrepresented students and of STEM degrees. In contrast, at the UPR, 40 percent of the degrees are STEM, and two-thirds of its student body qualifies for need-based aid. The UPR produces 16 percent of the Hispanic STEM workforce in the U.S. Historically, the people of Puerto Rico have viewed their public university not as a cost or as a burden but as an investment — the kind of investment most needed in times of economic crisis. The governor is fond of the “family” metaphor. He often compares Puerto Rico and its current fiscal crisis with a family that needs to make hard choices to face periods of economic crisis, and wonders out loud about why the UPR cannot seem to be able to “tighten its belt” like so many families have done around the island. But even within the metaphor, choosing to take resources away from the public university in times of fiscal crisis would be akin to taking away children’s educational opportunities. Few families would agree with this choice. The Constitution of Puerto Rico (section 5, art.2) provides for a free public education system, covering first-grade through 12th grade. This was in 1952, when a high school diploma brought a certain amount of prestige and a number of job opportunities. It could easily be argued that what a high school diploma meant in the ’50s, the college degree means today. Affordable, public higher education cannot be seen as a cost or expense, but as value. It is one of those things where Puerto Rico consistently “lo hace mejor,” or “does it better.” It is one of the best investments we have made as a collectivity, as a society. Let us protect it. The author is an associate professor at the University of Puerto Rico’s Mayagüez campus. She regularly blogs in www.parpadeando.net. Queer Chicana Professor (and all-around awesome academic) Sandra K. Soto got booed at the University of Arizona's Social and Behavioral Sciences commencement. Professor Soto was attempting to discuss the ways that the anti-im/migrant measures known as SB1070 would marginalize Latinos/as. Before she could get a sentence out the crowd jeered her. Twitter drama ensued. Most people said it was inappropriate for Professor Soto to use the event as a "political soap box" further highlighting the success of the conservative right in advancing the idea that Universities and institutions of higher education should be depoliticized places where one goes to learn objective truths. Meanwhile, if you ask me, it's pretty inappropriate for an audience of presumably educated adults to boo a woman of letters. Of course, what happened to Professor Soto is just another example of what so often occurs to queers, women, and people of color (or people who inhabit all of those identities) within the academy, they get shouted down and told that they're advancing a narrow agenda or only telling half the story. The events that transpired were truly shameful, but unfortunately are becoming more common than not on college campuses. I applaud the stand that Soto and other educators in Arizona are taking despite the attempts to silence them. As Professor Soto urges us...we must fight for public education. Governments go bad in different but interestingly similar ways. In Arizona, racist anti-immigrant legislation has been signed into law, and police and citizen vigilantes join in the unwarranted persecution of legal and illegal Latino residents. In the US territorial Commonwealth of Puerto Rico, an equally “tea-party” --evangelical statehood advocates in this case-- Republican Governor and Legislature, albeit “Latino,” have turned on State employees, firing between 20 and 25 thousand in the past year, and now proceed to disarticulate and privatize the Island’s most prestigious, functional, and liberal public institution, the 11-campus, 60 thousand-student-strong public university system. In Arizona, the “brown rats” (a reference intercepted online in an exchange between full and part-time Arizona residents) are illegal Mexican and Central American immigrants but also Puerto Rican, Cuban, Dominican, and other legal Latino residents. In Puerto Rico, the “revoltosos” (disruptive rats to the current University administration and State government) are liberal, independence and/or social democratic-leaning students, professors, non-teaching university employees, and the growing number of non-statehood and (increasingly) statehood parents, general citizens, unions, and political organizations that support them. Perhaps the comparison seems far-fetched, yet the issues involved are not just racism, on the one hand, and the right to and funding of education, on the other hand. In both Arizona and Puerto Rico, one whose current government is openly anti-Latino and the other a government obsessed with muzzling and suppressing all opposition to become the first Spanish-speaking US state, elected and appointed officials willfully bend the law (and abuse protected democratic rights) to their ideological wills, regardless of the consequences, and if existing laws do not serve their purposes, new ones are passed that do. It is the point where white supremacy and the class supremacy of a ruling elite meet eye-to-eye and heart-to-heart. A national uproar follows the new law in Arizona that permits ethnic profiling in search and detainment procedures and, by extension, proposes the elimination of courses in bilingual education and ethnic and multicultural studies from public school curricula. In contrast, Puerto Rico remains a well-kept political secret for most US citizens. Political news, except for hurricanes or other phenomena that affect the tourist industry, usually receives attention only in the fringe media. On this island of nearly 4 million inhabitants, where the majority lives below the US poverty level (the per capita income is less than half that of Mississippi, the poorest US state) and the government annually receives hundreds of millions of federal dollars to administer food stamp, social services, and, particularly, educational programs, politicians get away with just about anything without raising the eyebrows of oversight committees or gaining the kind of attention now being devoted to Arizona. From the North looking South, it is easy to forget that all Puerto Ricans are US citizens and are supposed to enjoy the same constitutional protections as all other citizens. In early 2009, the newly elected statehood Governor Luis Fortuño declared a financial crisis, and the Legislature, controlled by his party, passed the controversial Law 7, an emergency bill that suspends existing public employee and union agreements and contracts, permits the radical revision of institutional budgets and funding formulas and the firing of personnel, levies new taxes, and penalizes resistance to its provisions. For that reason, last year over 20 thousand untenured and tenured public employees could be summarily dismissed. In the face of the crisis, the members of the Puerto Rican Senate and House of Representatives have annual salaries and excessive expense accounts that surpass those of the great majority of their homologues in the 50 US states. As an autonomous educational institution, Law 7 should not apply to the University of Puerto Rico. The University of Puerto Rico, with its main campus in Río Piedras (San Juan), has been a beacon of intellectual and scientific endeavor for decades. This Casa de Estudios has been home to the exiled Spanish Nobel Laureate Juan Ramón Jiménez, the gateway to recognition in the US for countless Latin American artists and intellectuals, and the training ground for generations of writers, doctors, teachers, scientists, artists, lawyers, social workers, urban planners, accountants, journalists, and communications, media, computer, and business specialists, etc. --the entire professional infrastructure of Puerto Rican society. It is the one remaining public institution of national and world prestige and, although tarnished by decades of Government interference, is the only unbroken sector of an otherwise dysfunctional bureaucracy mired in party politics and financial corruption. However, a campaign has been mounted to severely undercut its services and programs. The 2010-2011 budget will be reduced by 100 million dollars. 23 million will be sliced from the flagship campus in Río Piedras. The Governor mandates the composition of the University’s Governing Board ( Junta de Síndicos ), which recently installed a new President in a process directly influenced by the Governor’s staff. Unfortunately, the academic senates of the UPR campuses acquiesced to the politics-as-usual appointment. Then, behind closed doors and without consultation with academic and administrative deans and faculty representatives, the Governing Board began to dictate the terms of the new budget measures through their mouthpiece, José Ramón de la Torre, the new UPR president. The UPR faculty knew something of what to expect: no academic promotions (with accompanying salary-level changes) were awarded and no cost of living increases were assigned in 2009-2010 (that will no doubt continue in the near future); no sabbatical leaves, heavier teaching loads, less or no funding for travel and research, no new faculty hiring, reduced technical and clerical staff, with no possibility for hiring new non-teaching personnel, no improvement of physical facilities, and cutbacks on academic services, etc. will probably prevail as well. Whether or not non-tenured and tenured faculty will lose their positions in 2010-2011 because of budget cuts is still unknown. But the new and immediate restrictions were directed at the student body -- a reduction in tuition waivers for academic, artistic, or sports excellence; no Pell grants for those who do receive tuition waivers; a severely limited summer school offering and, in general, reduced course offerings in the future; the continued privatization of campus services; the rumor of the sale of regional campuses to a local mass-education community college chain; and of course, no student input in these decisions and no transparency in terms of how and by whom the decisions are being made. In fact, measures such as the elimination of tuition waivers, which the UPR administration insists upon with the bellicosity of a playground bully, would result in only miniscule savings. The greater issue is the patriarchal structure of authority: the Governor, the UPR’s Board and President, and the Interim Chancellor of the Río Piedras Campus are not to be questioned. Good children obey; bad children who do not are severely punished. The student protests, teach-ins, and requests for dialogue in early April went unanswered. A large general assembly elected a negotiating committee and voted in favor of a two-day class/work stoppage, during which they would occupy the Río Piedras Campus. That stoppage, it was decided, would become an indefinite strike only if the UPR administration refused to begin a serious dialogue with the negotiating committee over student issues. On the morning of April 21 st , the first day, the administration gave its “full-metal-jacket” response: an estimated 250 state police officers, including helmeted and armored tactical operation forces (shock troops) at all campus gates, virtually guaranteeing a full-scale student strike. The situation has only worsened in the past three and a half weeks. The administration has made, at best, only half-hearted attempts to meet with the negotiating committee and broke off dialogue in the one meeting in which some progress seemed to be made. The students held another general assembly --this time off campus to permit full and free participation-- on May 13 th in the large San Juan Convention Center. Now an overwhelming majority --greater than the initial assembly-- voted to continue the strike. The following morning the Interim Chancellor, Ana R. Guadalupe gave the directive that no one and nothing would enter the Río Piedras Campus, and the state police beat and arrested a father who tried to deliver food and water to his son. During the rest of the day tension and flurries of violence continued as parents, professors, local artists, and supporters arrived with food and water and defied the police and the chancellor’s directive. Again, the administration responded, this time by officially closing the campus, first for a maximum period of thirty days, but then for a definite period until the July 31st. The administration has done virtually everything in its power to provoke the students camped inside the UPR Campus to become the “revoltosos” they have tried to characterize them as being. Yet, with the exception of one incident of self-protection with mustard or pepper spray on the first day (April 21), the striking students have committed no incidents of violence, no trashing of facilities, no vandalism. They separate their garbage for recycling and pass it out of the campus where municipal garbage trucks pass to pick it up. They read --in an early act of solidarity, professors handed copies of their own books and those of others to them through the campus fences--, play soccer, listen to music, and have established their own radio station, websites, and blogs that originate from the campus. They paint posters, create and stage plays and acts of performance, and although they sleep in tents, they have all found ways of slipping out and back on the campus virtually unnoticed by campus and state police. The UPR faculty is united for the first time in years in its support of the student demand for dialogue. The professors’ association (APPU) is particularly active, but non-affiliates also participate freely. Scheduled academic symposia and conferences have also taken place without incident off campus. Students and faculty from the regional campuses of the UPR support the strike. Although late arrivals on the scene, five academic deans from the Río Piedras Campus recently wrote a letter urging a negotiated settlement that includes all sectors of the university community and not just the unilateral decisions of the Interim Chancellor, the President, and the Governing Board. Popular support continues to grow. As well as artists, intellectuals, and opposition politicians, island labor unions are supporting the students by staging a general strike --the second in less than 8 months-- on May 18 th . Is there an end in sight? The main Río Piedras Campus of the University of Puerto Rico remains officially closed until July 31 st , yet it is active, creative, dynamic, and productive because it is occupied by the best representatives of Puerto Rico’s democratic future, a future the current government in its fanatical authoritarianism wants to negate and silence. Students ( revoltosos ) in Puerto Rico and legal and illegal Latinos (“brown rats”) in Arizona: both groups represent the future and the promise of a better, more democratic and egalitarian society, not only in their respective states but in all of North America and the Caribbean. Obviously, those who oppose them with such obsessive rigidity and prejudice hold the power and the wealth and are willing to use violence in their attempt to block that future. *Lowell Fiet has been a Professor at the University of Puerto Rico, Río Piedras Campus, since 1978 and currently directs the Interdisciplinary Studies Program of the College of Humanities. He was the Director of the English Department on three different occasions, founded the academic journal Sargasso , co-authored the PhD Program in Caribbean Literature and Linguistics, headed the Rockefeller Foundation-funded Caribbean 2000 Project (1994-99), and has directed National Endowment for the Humanities summer seminars and institutes at UPR-Río Piedras. He is also a leading critic of Puerto Rican theater and performance and has been the critic for the weekly newspaper Claridad for the past 18 years.